SPEECH BY THE BISHOP OF LONDON. After the Duke of Connaught had made the customary inspection of the exhibition, a lunch was given in the building to memory dear as the Café Brébant, and the Bishop of London proposed the toast of "Prosperity to the Exhibition." He said, with a good deal of truth, that it would have been difficult to arrange an exhibition of the sort which would give a larger amount of pleasure to a larger number of people. He added that they trusted that as time went on there would be hundreds upon hundreds who would partake of the pure and delightful pleasure given by the sight of one of the most beautiful things that God had created—the beauty of the world of flowers. God had appointed that man should subdue the earth, and in the resources of that sovereignty he did not know anything which might more worthily claim the attention of mankind, and which brought a greater reward to those who devoted themselves to it, than the cultivation of flowers. Lunch over, the guests who had been present at it, as well as most of the other visitors to the Exhibition, spent some part of the rest of a happy day in welcoming Colonel Cody and his cowboys to the arena of their former triumphs. Age has not withered them, nor time added any great variety to their entertainment. 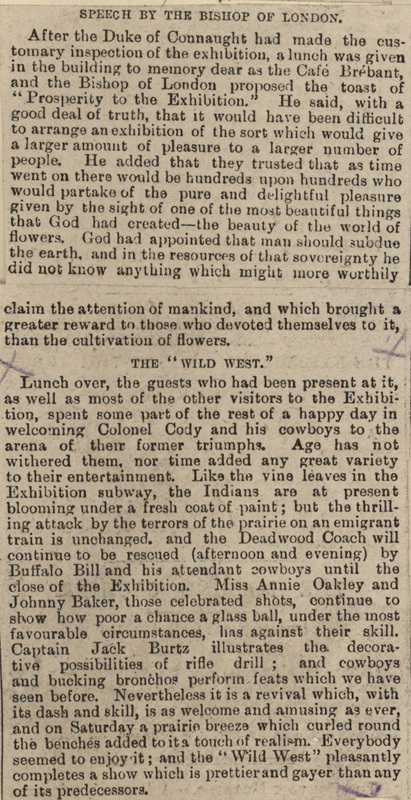 Like the vine leaves in the Exhibition subway, the Indians are at present blooming under a fresh coat of paint; but the thrilling attack by the terrors of the prairie on an emigrant train is unchanged, and the Deadwood Coach will continue to be rescued (afternoon and evening) by Buffalo Bill and his attendant cowboys until the close of the Exhibition. Miss Annie Oakley and Johnny Baker, those celebrated shots, continue to show how poor a chance a glass ball, under the most favourable circumstances, has against their skill. 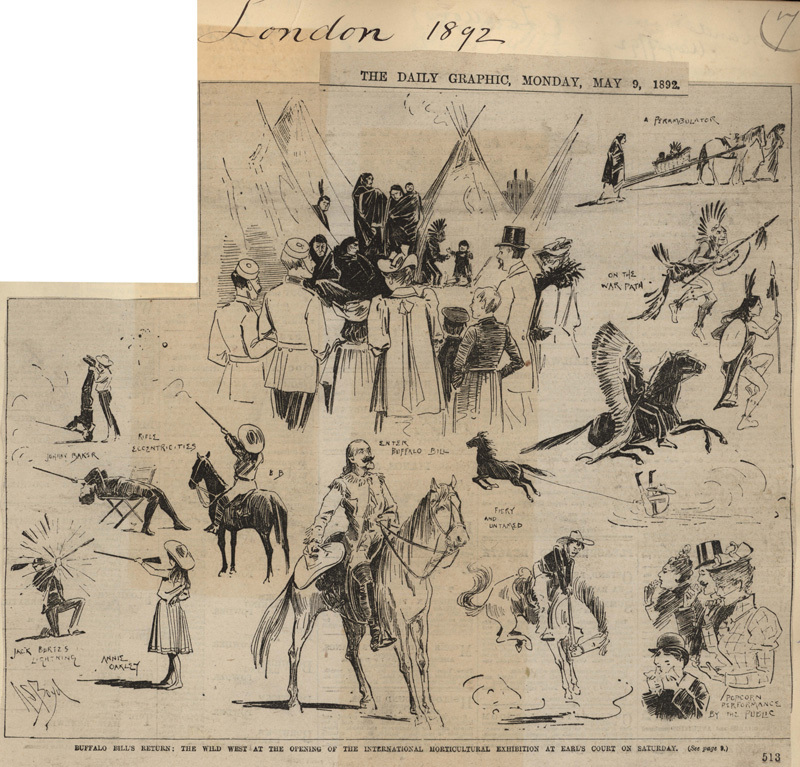 Captain Jack Burtz illustrates the decorative possibilities of rifle drill; and cowboys and bucking bronchos perform feats which we have seen before. Nevertheless it is a revival which, with its dash and skill, is as welcome and amusing as ever, and on Saturday a prairie breeze which curled round the benches added to it a touch of realism. Everybody seemed to enjoy it; and the "Wild West" pleasantly completes a show which is prettier and gayer than any of its predecessors. Note: Alexander Stuart Boyd (1854-1930); born in Glasgow; a painter specializing in landscapes; began magazine work in his native city, contributing under the name "Twym" to the journals Quiz and The Bailie; joined Punch in 1894; illustrated Israel Zangwill's Ghetto tragedies (1894), as well as books by Bret Harte, Jerome K. Jerome and various Scottish authors.